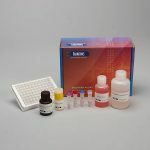 The Salimetrics DHEA Enzyme Immunoassay Kit is a competitive immunoassay specifically designed and validated for the quantitative measurement of salivary Dehydroepiandrosterone (DHEA). It is not intended for diagnostic use. It is intended only for research use in humans and some animals. Salimetrics has not validated this kit for serum or plasma samples. 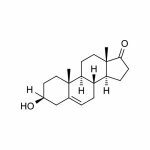 DHEA is a major secretory product of the adrenal glands; it is co-released along with cortisol in response to ACTH from the pituitary gland. Circulating levels of DHEA decline rapidly after birth and remain low until about the age of 6-8, when they begin to rise. This prepubertal onset of adrenal production, known as the adrenarche, involves enzymatic changes within the adrenal gland. DHEA levels increase until the third decade of life, then they begin to decline again. Significant reductions occur after the age of 50. A major role of DHEA is to act as a circulating precursor for conversion to androgens and estrogens in tissues throughout the body, and it has also been associated with immune function. In addition, DHEA is produced directly in the nervous system, where it functions as a neuroactive and neuroprotective factor. In blood, only 1-10% of DHEA is in its unbound or biologically active form. The remaining DHEA is bound to serum proteins. Unbound DHEA enters the saliva via intracellular mechanisms; the majority of DHEA in saliva is non-protein bound. Salivary DHEA levels are unaffected by salivary flow rate or salivary enzymes. DHEA exhibits a diurnal rhythm similar to cortisol, with highest levels in the morning after awakening, followed by a decline throughout the afternoon and evening. This is a competitive immunoassay kit. DHEA in standards and samples compete with DHEA conjugated to horseradish peroxidase for the antibody binding sites on a microtitre plate. After incubation, unbound components are washed away. Bound DHEA Enzyme Conjugate is measured by the reaction of the horseradish peroxidase enzyme to the substrate tetramethylbenzidine (TMB). This reaction produces a blue color. A yellow color is formed after stopping the reaction with an acidic solution. The optical density is read on a standard plate reader at 450 nm. The amount of DHEA Enzyme Conjugate detected is inversely proportional to the amount of DHEA present in the sample.